UP Paryavaran Sanrakshan Sansthan Latest News 2019 UP Government denied involvement of Paryavaran Sanrakshan Sansthan Bharti 2019 that has more than 37,019 vacancies running out on internet. So The Breaking News of Paryavaran Sanrakshan Sansthan is now become fake and we advise you to not apply before any new clarification given by government. 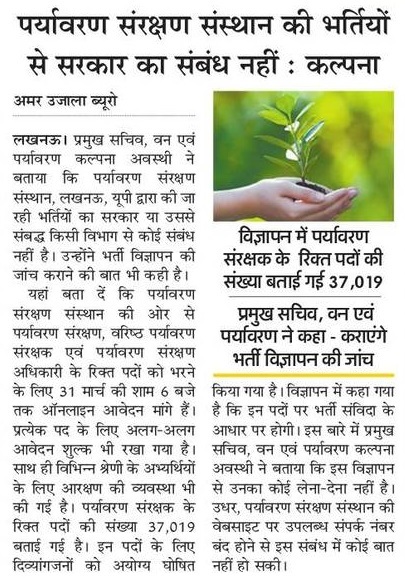 UP Paryavaran Sanrakshan Sansthan Paryavaran Mitra Bharti 2019: The Main secretary of Environment and Forest department is SMT Kalpana Avasthi. She told in a press meeting after some journalist asked by Paryavaran Sanrakshan Sansthan Bharti that we don’t know about any Paryavaran Sanrakshan Agencies. And we soon handover to our IT Cell to verify these Paryavaran Sansthan Vacancy 2019 and its agency. PSSUP.IN 23 March News: As per News there is one website running online who is jobs on Paryavaran Sansrakshak, Paryavaran Mitra and Paryavaran Sanrakshak Adhikari. Last date to fill application form and uploading document is 31st March 2019 up to 6.00 PM. 3. Paryavaran Sanrakshak 37019 posts. Application Fees: Candidates have to pay different fees according to different jobs that are viral online. Categories wise: And to and all selected person will eligible to apply as their category of General OBC SC ST.
Advertisement says all posts are on Samvida basis which will later on become permanent. Website: Now no phone number is ringing which was visible on Paryavaran Adhikrit Website. Vigyapan Tithi date of online application form is 5 March 2019. Last Date of Payment: 21 March 2019.